Use our toolkit to help children’s public speaking skills. Contains extra resources on Samai in Sierra Leone. 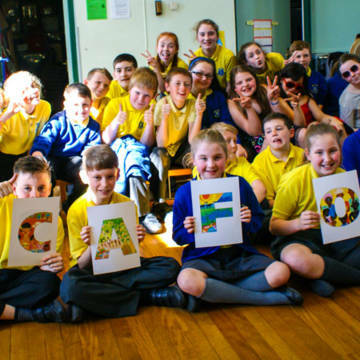 Our colourful powerpoint is a great way to start explaining about CAFOD and get children interested in speaking up. A short talk for children to practise public speaking and to speak out for CAFOD. Listen to the short talk marking any words on your score card as you hear them. As soon as you get any full line of four vertically, horizontally or diagonally shout “line”. If you have marked all of the words on your card shout “house”. Whole school assemblies and children's liturgies.